The Anaheim Ducks are riding a streak of six-straight division titles. Will they reign supreme in the Pacific and make it six-straight this season? The Hockey News is rolling out its 2017-18 Team Previews daily, in reverse order of Stanley Cup odds, until the start of the season. Today, the Anaheim Ducks. How long is Ryan Kesler out and how does his absence hurt the Ducks? Initially, when it was announced that Ryan Kesler needed hip surgery, the belief was he’d be on the shelf for 12 weeks. That increased further with some reports stating upwards of four months. And now, as the season draws nearer, the most recent news out of Anaheim is that Kesler might not be back until close to Christmas. Let’s use Dec. 25 as a guide, then. If Kesler is ready to return at that point, he will have missed the first 37 games of the campaign. That’s nearly half the year. It’d be bad enough if Kesler was just an effective scorer, but he’s an all-situations player and was Anaheim’s most consistent center from start to finish last season. He put up 22 goals and 58 points, found himself in the mix for the Selke Trophy once again and was a beast in the post-season. Kesler’s absence for 10 games would be bad enough for the Ducks and 20 games calls into question how the team will cope. But sticking at the top of the division is going to be a monumental challenge for Anaheim with their second-line pivot out for 30-some games. Only Pittsburgh has won more games over the past five seasons than Anaheim. 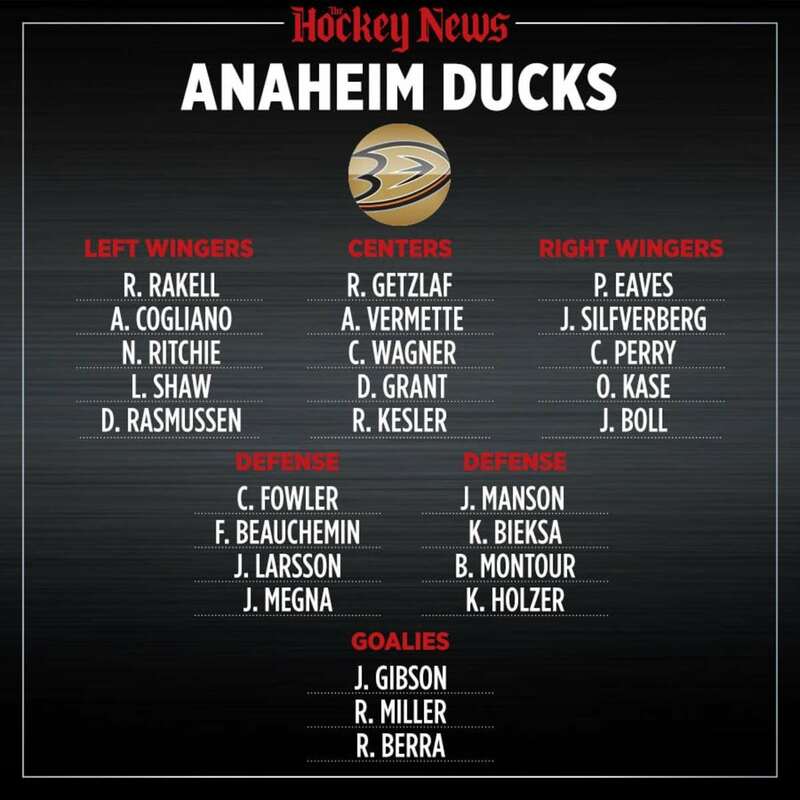 With veteran star forwards Ryan Getzlaf and Corey Perry leading the way – and the younger wave of Rickard Rakell, Jakob Silfverberg and Nick Ritchie getting better year after year – the Ducks are still the team to beat in the West. General manager Bob Murray did a nice job keeping his D-corps intact when it looked like expansion or salary cap issues would rob the team of one of Cam Fowler, Sami Vatanen, Hampus Lindholm and Josh Manson. And if Brandon Montour plays like he did in the playoffs, the Ducks’ deep and talented blueline will get even better. In net, John Gibson rates up there with Matt Murray as the best 25-and-under goalies in the league. Entering his third season as a No. 1, Gibson will be expected to raise his game to new heights. Having an American puck-stopping icon like Ryan Miller as backup will be nothing but beneficial in terms of pushing Gibson for starts as well as helping him ascend to the level hockey scouts have projected since he was drafted 39th overall in 2011. Did anyone predict Perry’s production getting sliced in half last season? The 2010-11 Hart Trophy winner had scored at a 40-goal pace over six seasons (212 goals in 436 games) since and including that magical 50-goal term that also won him the Rocket Richard Trophy. What if the drop to 19 goals is more harbinger than aberration? Perry still generates a ton of shots and is effective when ornery, but 32 is a common age when the sap starts to dry up in the sticks of goal-scorers. Patrick Eaves was a scoring sensation in 2016-17 for the first time in his long career and ramped things up even more after coming over from Dallas at the trade deadline, scoring at a 45-goal clip over the final 20 games of the regular season. He was such a good fit on a scoring line that the Ducks signed the UFA winger for three more years at $3.15 million per annum. But what if Eaves, who’s 33, can’t repeat his career season? He’d be an expensive ticket in the bottom six, and chances are that’s where he’ll eventually wind up. After all, Eaves scored at a 15-goal pace during his first 11 NHL seasons before last year’s 32-goal output. THN’s PREDICTION: 1st in the Pacific. Make it six division titles in a row. The Ducks are the Pacific Division’s regular season powerhouse and that’s not going to change anytime soon.